This affirmation is meant to remind and inspire. We literally walk right past million dollar ideas every day. What if we just paid a little more attention? Million dollar are as common as grass. My million dollar idea is coming to me today. Four simple words make all the difference. Either we believe we can or we won’t. This affirmation can be used in the moment to pump your belief in your ability to do it. I often encounter people who look at the world in horror and say, in desperation, “I want a different world, but what can one person do?” Similarly, there are people who feel powerless to change their own lives for the better. They allow what they cannot do to stop them from doing what they could do. The problems that face us individually and collectivley can be overwhelming at times. Their enormity depresses some, makes others apathetic, and still others angry. The amazing thing is that these same conditions inspire others to strive for something better, more complete, more empowering. The key is to focus on what we can do rather than what we cannot. John Wooden’s accomplishments, while not world-changing, are staggering in sports terms. He led the UCLA Bruins men’s basketball team to 10 NCAA national championships in 12 years between 1964 and 1975. In that span his teams, went undefeated four times. Only one team in men’s college basketball has completed an undefeated in the 33 years since. As a revered coach, Wooden’s words have become legendary. Today he is 97 years old. Someone who has achieved that level of success in any field and that scale of longevity bears listening to. 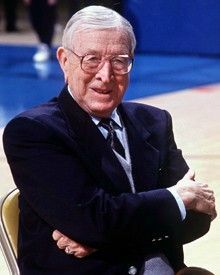 Coach Wooden tells us not to let what we cannot do interfere with what we can. Maybe you can’t end world hunger today, but you can donate time or money to those helping to feed the hungry. Maybe you can’t create a more just political system overnight, but you can collaborate with others and take steps that will get us there one day. Maybe you can’t attain your financial goals today, but you can begin making the changes and taking the chances that will lead you to that goal one day. Maybe your life is too filled with stress and pain to achieve complete happiness today, but you can at least beging releasing the stress and the pain so that one day you can know that happiness. Maybe your dream of being a world-class dancer has to wait another year, but you can still work on perfecting the dance in preparation for that day. Maybe world peace is not in the cards for humanity today, but you can create a more peaceful world through every encounter you have today. The fact is that you may not reach the mountain top today. That does not mean you stop climbing. For these days when you worried, stressed, and strove over your goal, will be “the stuff” the dream is made of when you do achieve it. Ray Davis is founder of The Affirmation Spot, a website offering downloadable mp3 motivation tools. Ray’s 2015 speculative fiction novel, Anunnaki Awakening: Revelation, is turning heads. Where did humanity really come from and where is it going? This is Book 1 of a trilogy. The Awakening has begun! Learn more about the trilogy and order your signed copy today at AATrilogy.com.